Family tree w/seven photos heart silverpl.lacq. Photo frame first year for 13 photos 29x25x3cm sp./lacq. Photo frame First year with clay print sp./lacq. Photo frame Family Tree (10) sp./lacq. Baby's first year in 13 photographs, one for each month! The photo frame is silver-plated and lacquered, and therefore requires no polishing. Baby's first year in 13 photographs, one for each month! With space for a hand or footprint in clay. The photo frame is silver-plated and lacquered, and therefore requires no polishing. Photo frame in the shape of a (family) tree, with 12 small frames. The frames are two-sided. The photo frame is silver-plated and lacquered, and therefore requires no polishing. 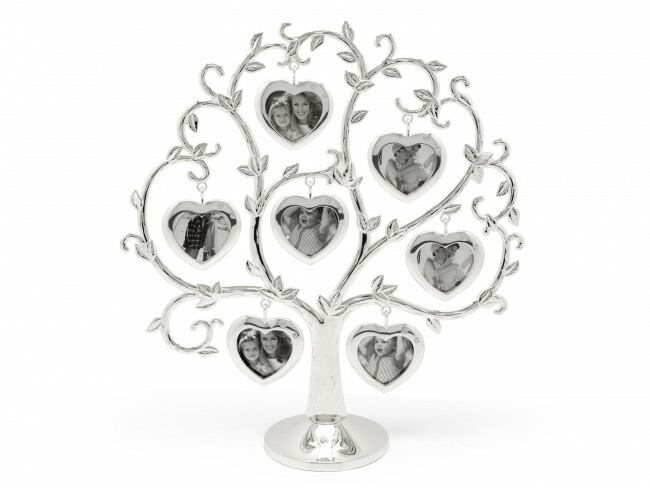 Photo frame in the shape of a (family) tree, with 7 small frames. The frames are two-sided. The photo frame is silver-plated and lacquered, and therefore requires no polishing. You're reviewing: Family tree w/seven photos heart silverpl.lacq.